You may have noticed I didn’t post a menu plan last week. I actually had fun just deciding meals on the day – based on what I had in the house that needed to be used up. But this weeks it’s back to planning. For more great menu ideas visit the Organising Junkie. This entry was posted in Menu Plan Monday, Muffin Tin Monday. 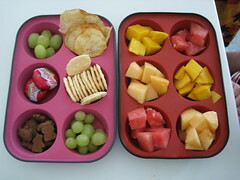 fruit, cheese and crackers…um, I want that muffin tin for lunch!! Those tins look yummy (and I don’t even eat fruit) – so colorful!